The Muslim Is Coming! The Muslim Is Coming! 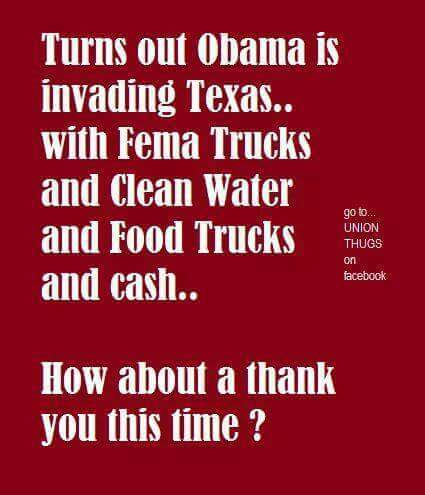 We really need a picture of Greg Abbott and Ted Cruz with a FEMA truck. Yeah, the same Ted Cruz who voted against Hurricane Sandy relief. I think the President needs to come to Texas and personally hand out FEMA funds and drive a few tractors to do the clean-up. Then have a dinner and serve up a big ole heaping plate of crow.